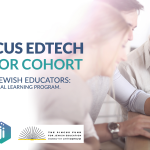 Join a cohort of European Jewish educators for the Pincus EdTech Incubator Program: a 10 month professional learning program that maximizes the use of educational technology in Jewish schools. Educational Technology has proven to deepen and enhance student driven learning, maximize fluency and interactivity, and drive passion in the classroom. Brought to you by JETS Israel and Jewish Interactive, leaders in educational technology tools and training, subsidized by a generous grant from the Pincus Fund.